This classic instrumental reached No 1 in 1968 then went Top 5 upon its re-release in 1973. We examine Peter Green’s flight of fancy… Very manageable slow tempo with a straightforward melody means that this tune should be well within the reach of most. Peter Green’s sound could be warm, bold, delicate, stinging or soothing, but it was always passionate. His Les Paul with one back-to-front pick-up was his mainstay until he let Gary Moore have it for a pittance, in line with his growing distaste for materialism. But it sounds to me like Albatross was recorded using a Strat on the front pick-up. In any case, you need a warm, clear tone with perhaps a hint of amp overdrive (not distortion in the accepted sense). loudspeaker pushes more air to excite the strings (yippee!) which sends more music to the amp which pushes more air… Such a situation is predictably referred to as a feedback loop and the acoustic medium is crucial, so don’t bother looking for a processor patch offering such an effect. Of course, compression is a reasonable form of processing to auto-amplify decaying notes and a fairly deep reverb wouldn’t go amiss, either. If you truly wish for the ultimate in sensitivity, responsiveness and sweetness of tone then you’ll have to listen to a ‘class A’ amplifier (I use Mesa/Boogie and Cornell while Brian May, The Hellecasters, Jimmy Vaughan and Hank Marvin rave about Matchless gear. SJB’s Ant, Carvin and the odd custom manufacturers might oblige too. Oh, and there’s a company whose name starts with V and ends in X that might have had some part in the history of tone!). A few more considerations regarding tone and how to become a guitar legend: just compare the difference in sound and effect between caressing the strings when playing through a loud amp or violently attacking or plucking the strings when using high gain but relatively low settings. Of course it’s not for me to say which is best or most desirable; you should discover for yourself and develop good taste while sharpening your aural senses, too. I mention all this so that you may come to this transcription with the appropriate attitude. Firm (but not excessive) fretting finger pressure is desirable. The music is uncluttered and the goal might be to recreate the sensation of gliding or floating through the air, which the composer obviously desired. The dynamics, type and intensity of vibrato are of the utmost importance. Don’t use vibrato gratuitously, rather let it help you articulate a musical statement or phrase at selected moments. I chose the naturally accommodating time signature of 12/8 (four groups of triplets). In fact the most common rhythm (observe the bassy tom toms) is a lop-sided one which highlights the first and last thirds of an 8th note triplet – this is the staple of many slow blues tunes and typically very Status Quo (at a slower pace, though). 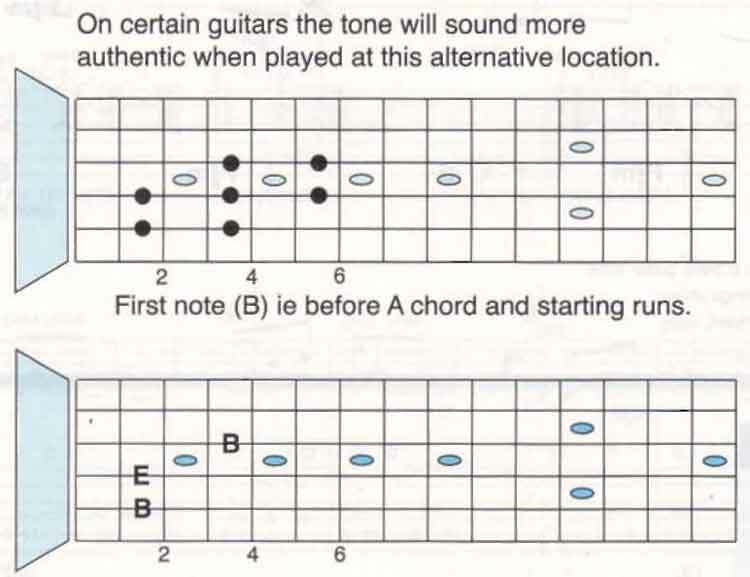 Sure enough, the two main chords (A/E and Emaj 7) usually stick to the rhythm just described. And the take effect (ie ‘brushing’) in accordance with the direction of an arrowhead is obvious to hear. Don’t be too literal with notated rhythms; Peter was a master of evoking timelessness, if you know what I’m trying to say. I’d advise you to interpret rests here as breaths – appreciate the very reasonable connection between human phrasing and any rests within the space of a bar or two. Some players are convinced that humming/grunting/singing along with their guitar playing pays dividends in terms of expression and projection. Anyway, I feel sure that Peter would have had held down notes a relatively long time here, even if you notice a substantial decay in sound level. The rhythm of the notes when entering the implied F# minor should generally sound like saying ‘dweeoo’ (as opposed to the typical triplet-based ‘diggety’). Only towards the end of the tune did I feel that the articulation was slightly swifter, requiring the use of the odd grace note. The end of measure 15 demonstrates an unexpected trait – a pull-off where the second note is louder than the first. This is perfectly reasonable, but less predictable than the norm. Just pull off with a positively downward finger motion, possibly a little more inward than usual. Whereas a hammer-on is really self explanatory, successful pulling-off often eludes the novice. Bar 17 introduces the famous harmony melody. The two single notes are panned left and right on the original recording so it’s probably safe to assume that overdubbing was brought into play on this occasion. If you have a guitar playing friend or colleague, try a duet and swap parts for a challenge! If you decide to play both parts at once, then providing you have light gauge strings you’ll still hopefully be able to cope with the transcription the way I’ve decided to offer it here. Jerry Donahue fans will know that dual bends are quite feasible with a lot of practice, but fear not because most of this section is fingerboard-friendly by virtue of the diatonic thirds in the key of E major (ie the note pairings: E and G#, F# and A, G# and B). 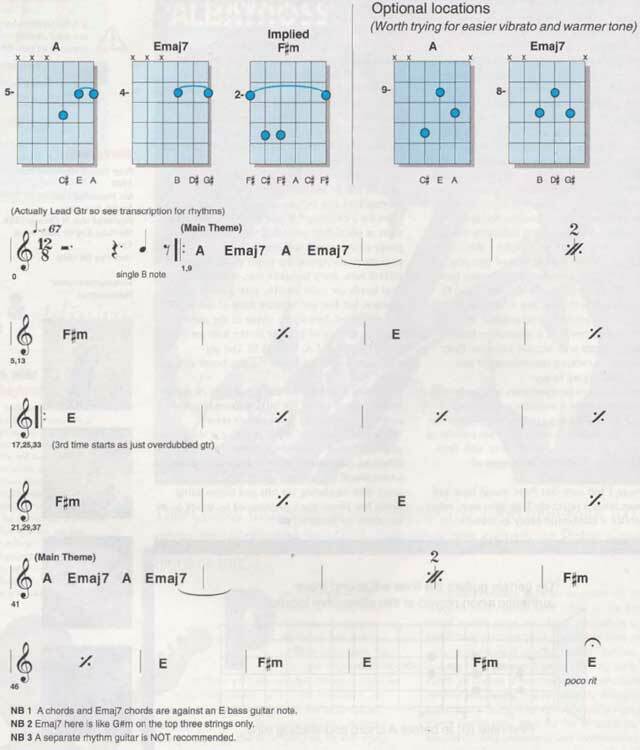 Use my suggested fingerings beside the noteheads and go for it! Panned a little to the right (but with its reverb return panned left in the mix) is another guitar part which is evident by its deeper reverb ‘wetness’. Once again, if you’re going it alone you might not be able to include every one of the fills/licks, particularly when you consider that this (overdubbed) part is slide guitar. You might get away with emulating the bits and pieces using bends but please don’t get stressed by trying to do too much by yourself! Don’t forget to check Black Magic Woman by Peter Green. 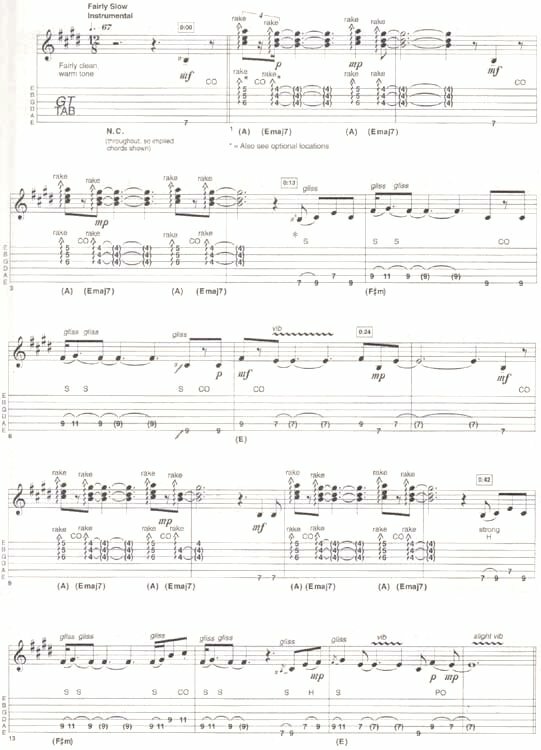 It’s just a part of Fleetwood Mac Albatross guitar tab and sheet. © 2012 - 2019 TabsClub Powered by TabsClub 41 queries in 0.261 seconds.